AdriaHost Review 2019: Is AdriaHost a Good Hosting? Serbian IT solutions company AdriaHost offers a full suite of services including shared hosting, VPS hosting, dedicated servers, domain registration, and SSL certificates. Their entry-level package is rather limited in features, but otherwise this provider can get the job done. Founded in 2006, AdriaHost has provided web hosting services to over 5,800 companies, 590 agencies, and 2,600 individuals. Although they’re staffed by a small but expert team, they’ve already expanded their reach beyond the borders of their country and now have offices in both London and Serbia. Their website and support is available in English and Serbian. AdriaHost is a full-service website hosting company providing shared hosting, VPS hosting, dedicated servers, Windows servers, and audio streaming hosting. They also offer domain registration, SSL certificates, website migration, SMS marketing, and more. AdriaHost doesn’t have a ton of beginner-friendly features, although they do provide users with the Softaculous app installer along with over 400 available scripts. Users wishing to launch an e-commerce website can do so with the help of their Business package or better, which comes with a shared SSL certificate and ready installations of osCommerce, Zen Cart, and CubeCart. Unfortunately, the Basic plan doesn’t include free SSL certificates, though it comes with a generous amount of bandwidth. AdriaHost hosts their customers on servers located in an Amsterdam-based data center. Since the team is based in Serbia and London, this means there may be a bit of a lag time when it comes to diagnosing and resolving hardware issues. It’s really easy to get set up with AdriaHost. The website is provided in English and Serbian and the content is really clear, so you don’t need a lot of knowledge to navigate. Purchasing a package and registering a domain is straightforward and can be done online in a few minutes. AdriaHost also has a free website migration service if you’d like to move your website over from another provider. AdriaHost’s plans are competitively priced when compared to both local and international providers. All packages, except for the Basic plan, include free SSL certificates. Note that only the highest-tier package includes a free domain registration. AdriaHost offers a discount if you purchase a plan for more than one year. In fact, if you opt for a three-year contract, the third year is free. However, this does mean paying upfront for three years of hosting, which is quite a commitment. Unfortunately, there are no monthly contracts and the shortest billing term is one year, payable in advance. Also, there are no free plans or free trial periods, although they do have a 30-day money back guarantee. It’s possible to upgrade or downgrade plans once you’ve signed up, which is a nice degree of flexibility. Their customer support channels are open 9AM to 5PM Monday to Saturday. You can reach their support staff via email, phone, Facebook, and Twitter. Their support is available in English and Serbian. I do get a little nervous that they close on Sundays and are not available in the evenings, particularly since many customers of e-commerce websites tend to shop more during those hours. That said, I’ve had great experiences whenever I’ve needed to contact them. I usually use Facebook messaging to contact them and they’ve always gotten back to me within a few minutes of my initial message. For more technical queries, they ask you to email them or submit a support ticket, which is understandable as this allows them to pull all the relevant information pertaining to your hosting account. AdriaHost is an average provider of website hosting. Their biggest draw is that they give you a free third year of hosting when you register and pay for a three-year contract upfront, but their Basic web hosting package is too limited in storage space and features to make it worthwhile. 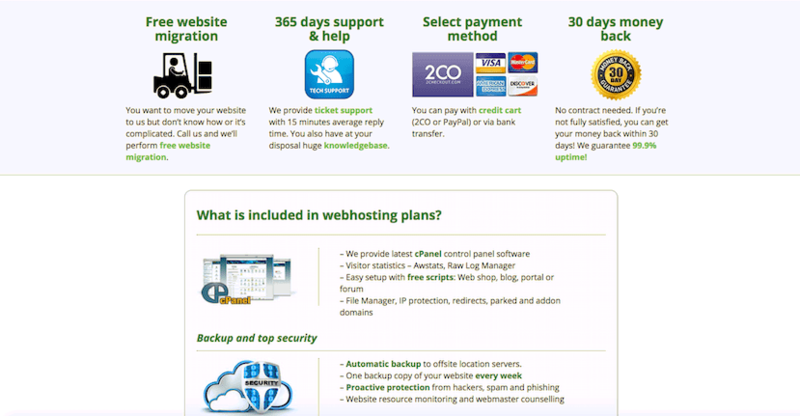 Wondering how AdriaHost stacks up against other Web Hosting companies? Enter any other Web Hosting company and we will give you a side-by-side comparison.